The Trigon 02 is the perfect way to automate a single leaf opening up to 3m, or a double leaf opening up to 5m. The motor is easy to install, strong and reliable. GENIUS have thought of it all, the arms even come in the same box as the motor! 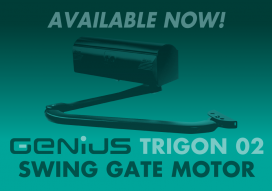 As a subsidiary of FAAC, GENIUS are World renowned for producing reliable, quality gate automation product, so you can rest easy knowing that you’re buying a premium product. Stock is selling fast, place an order today so you don’t miss out!